The Yakovlev Yak-15 (NATO reporting name "Feather") was one of the first Soviet jet fighter aircraft to be tested and go into production. Along with the Swedish Saab 21R, it was one of very few jets to be successfully converted from a piston-powered production aircraft. A Yak-15 was also the first Soviet jet aircraft to be successfully refueled inflight. The Yak-15 was one of several aircraft designs to emerge from the Soviet Union following a request from the Kremlin in February 1945 to begin designs of jet aircraft. It should be noted that this request came two years after the introduction of jet fighters in Nazi Germany, and nearly a year after the January 1944 introduction of jets into the U.S. military. Though the engine design firm of Lyul'ka was making progress in developing a Soviet designed jet engine, Stalin announced that as a temporary measure the German Junkers Jumo 004B and BMW 003A jet engines would be built in the Soviet Union until an indigenous design was ready, these engines being designated the RD-10 and RD-20 respectively. 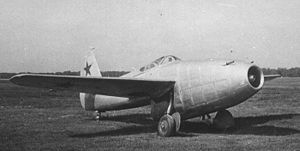 Sukhoi began development of a twin jet aircraft of a design similar to the German Me 262, while Yakovlev pointed out that the thrust of the Jumo 004B was well-suited to the existing Yak-3 fighter, and was instructed by the Kremlin to begin a crash program of designing and building such a conversion. The development of the Yak-15 was assigned to Yakovlev designer Ye G Adler, assisted by Shekhter, and they presented the first three-view sketches just three days later. Further drawings were issued to the OKB experimental factory in late May 1945. Despite the dramatic change in engines, no real difficulties were encountered, and the loaded weight of the Yak-15 was actually found to be less than that of the Yak-3. To expedite development, existing drawings were used of the Yak-3/VK-107A for the all-metal rear fuselage, horizontal tail, and main undercarriage, as well as for most of the wing. The front of the welded-tube fuselage truss was considerably modified to carry the Jumo engine, which was hung underneath on rubber shock-absorbing mounts. Though the engine was inclined 4 degrees 30' nose-up, the skin under the rear fuselage near the jet exhaust was of KhGSA chrome steel. The tailwheel was also fabricated out of steel, and lacked a rubber tire. It was protected by a small fairing which also served as the undercarriage door when retracted. The vertical tail was slightly enlarged and skinned in D1 metal, as was the heavily modified nose cowling surrounding the engine, which retained a Riedel two-stroke piston engine starter in the nose 'bullet'. The wing spars were strengthened, and the front spar was curved in an arch over the engine. A third fuel tank was also installed above the engine. Armament was intended to be the traditional single ShVak cannon, plus two UBS machine guns. The prototype was hand-built with utmost urgency and was flight-ready in October 1945. At the testing facility at Zhukovskii the aircraft was put through taxi tests by OKB test pilot Mikhail I Ivanov. Strangely, this was not immediately followed by flight testing, despite the urgency placed on the project by the Kremlin. Instead, the aircraft was transferred to the large CAHI wind tunnel, where it was tested until April 1946, often with the engine running. This delay allowed the prototype of the Yak's main competitor, the MiG-9, time to be completed and prepared for flight testing as well. Official Kremlin accounts state that the delay was due to "inclement weather", while Yakovlev claims that the reasons were purely political. Once the rival MiG-9 prototype, the MiG-I300, arrived at Zhukovskii, the flight testing was allowed to commence. On 24 April 1946, following the toss of a coin, the MiG made the Soviet Union's first jet flight, with the Yak flying three hours later. Flight testing proved completely trouble-free, and both prototypes were publicly displayed at Tushino Aviation Day on 18 August 1946. Early in testing the Yak-15 had been found to be an excellent design, and was ordered into production even before NII-VVS testing was completed in May 1947. Gen P M Stefanovskii did many of the test flights himself, and was delighted with the aircraft's handling, commenting that it was the world's lightest and cheapest jet fighter, but in no way inferior to heavier types. After going into production, a number of Yak-15s were modified for special research and experimental programs (see "Variants" below). These include the first Soviet jet to be successfully refueled in flight, using a looped hose connected to the starboard wing. The contract for production of the Yak-15 was awarded to Factory No. 31 at Tbilisi, and was a direct follow-up to their Yak-3 production. Stalin ordered that twelve Yak-15s and twelve MiG-9s should participate in the revolutionary parade in October 1946. This delayed production, as the proper tooling was not yet ready, and these aircraft had to be hand built. The twelve aircraft were completed on time, with the first of this special batch being test flown on 5 October, and the last by the end of the month, though ultimately the flypast was cancelled because of fog. Series produced Yak-15s, powered by the RD-10 engine (which had been cleared for 25 flight hours between overhauls) appeared at the end of 1946. Armament was changed to two B-20 cannons, and eventually two NS-23 cannons, each with 60 rounds of ammunition. A RSI-6 radio was installed, mounted to a wooden mast next to the canopy. On 1 May 1947 the May Day Parade over Red Square included 100 jet fighters, half Yak-15s and half MiG-9s, an event apparently never reported in the western media. NATO reporting name - "Feather", USAF/DoD reporting name - "Type 2". Total production and pre-production aircraft is believed to be 280. Yakovlev Yak-15 : Single-seat jet fighter aircraft. Yakovlev Yak-21 : Two-seat training version of Yak-15. Yakovlev Yak-15U : Experimental version fitted with a tricycle landing gear. Yakovlev Yak-21T : Two-seat training version of Yak-15U, (a.k.a. UTI Yak-17-RD10). Yakovlev Yak-17 RD-10 : First use of Yak-17. A laminar flow aerofoil, Yak-15 look-alike, with no commonality. The major production version of this aircraft, (a.k.a. Yak-Jumo, Yak-3-Jumo, Yak-15-RD10 and Yak-RD). A dual-control trainer version of the Yak-15, ordered by Council of Ministers directive No. 1498-665s, (a.k.a. Yak-Jumo vyvoznoy, Yak-15V, Yak-15UT, Yak-21V). The pupil's cockpit was added in front of the original cockpit, in the space previously occupied by the guns, and a new one piece side-ways opening canopy was added. Fuel capacity was unaltered. The single prototype had callsign "101", believed to be in yellow, and a capital "V" was painted on the rudder, which looks like a "B" in Russian. Flight testing began in May 1947, but ended because the decision had been made to build the Yak-17UTI, with a nosewheel undercarriage. An experimental version of the production aircraft incorporating a tricycle landing gear with a single castoring nosewheel housed in an external fairing. Information obtained from testing this aircraft led to development of the Yak-17 (a.k.a. sic Yak-15U-RD-10 with a tricycle undercarriage and drop tanks). This was a two-seat version of the Yak-15U, (a.k.a.UTI YAK-17-RD10 - no relation to the Yak-17 RD-10 described below). This aircraft was a Yak-15 look-alike, but was actually a completely new design with no commonality, ordered by Council of Ministers directive No.952-397ss. Designed to take advantage of new aerofoils developed by TsAGI, the Yak-17 RD-10 was fitted with an ultra-thin "laminar flow" wing, (the Lavochkin Aircraft 174TK was designed to use similar aerofoil sections). The new wing required a different undercarriage, and Adler, with Yakolev's support, created a strange main undercarriage with a single shock strut carrying the wheel outside a levered suspension leg. As a result, the wheel was both outside and well-forward of the strut. The leg was hinged to a main bracket inside the fuselage and retracted to the rear, while the lever pivoted so that the wheel was stowed in the wing root behind the main spar, covered by four doors on the leg and fuselage. The canopy also had a permanently fixed rear portion just behind the sliding section, which was faired into the fuselage. Taxi trials commenced in September 1946 but further development was cancelled, for unknown reasons.